When is a chip more than just a chip? A random anthropomorphic moment in life? Or a religious experience? 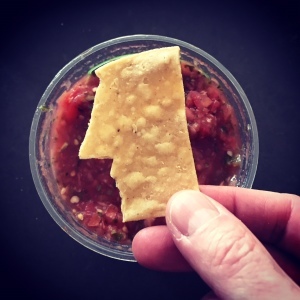 I love chips and salsa as much as anyone, but I definitely had second thoughts about eating this one (it came out of the bag exactly as shown, no retouching involved!). In some countries an object such as this would be treated as a heavenly miracle, revered as a holy shrine, and visited by millions of faithful believers. In other countries, it’s just something that taste’s good with a beer. 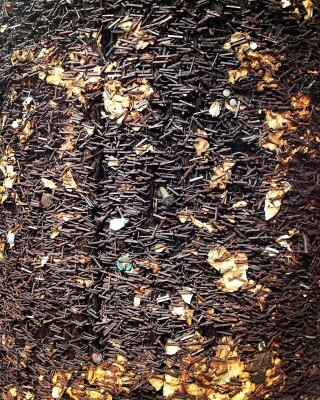 Guess how many staples and win a free prize! Billions and billions? This photo covers an area of approximately 12″(w) x 15″(h) and the entire telephone pole was covered like this on all sides, from two feet above the ground up to about eight feet. It was located right across the street from a rock and roll club in American’s best college town, Ann Arbor, MI, and I’m guessing that club has been advertising old-school style with band posters since the 1960s. Small cars that I have owned. Maybe this is where my love for vintage automobiles first started? I spent many hours as a child driving these cars over imaginary roads and bridges, imitating the automobile-oriented culture that I grew up in. My mom had the prescience to save these toys long after I had moved on and forgotten about them. They’ve been gathering dust for over 50 years now, but these cheap little metal vehicles are some of my most prized possessions. 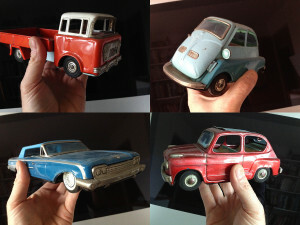 Clockwise from upper left – 1963 Jeep Willys truck, 1957 BMW Isetta, 1960 Fiat 600, 1960 Ford Fairlane. How many of these albums have you owned? 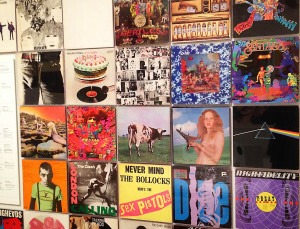 I saw this amazing display at MoMA recently and while I know vinyl records are making a comeback of sorts, I don’t think they will replace the convenience of mp3s (or whatever the next digital format comes along). Unfortunately, I gave away tons of albums and my Technics turntable back in the 90s. The large 12″ LP format was a real treat for music and art lovers. Today’s online thumbnail format for music, books, and even movies just doesn’t do justice to the artistic efforts involved in making images memorable. Maybe that’s why so much of our current culture is forgettable. How could someone let this happen to their Ray-Bans? One of the greatest sunglass brands of all time, Ray-Bans have been seen on celebrity faces from Marilyn Monroe to Roy Orbison to Tom Cruise. 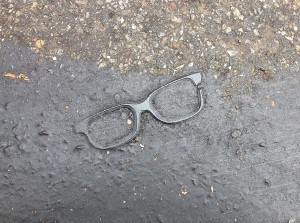 This unfortunate pair (not mine) met its flattened fate on a hot summer day in the city, becoming one with the pavement. Let’s hope they were just cheap knock-offs. 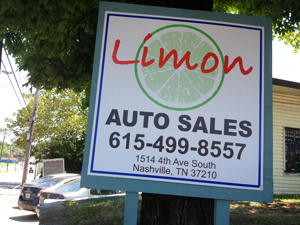 Every Car We Sell Is A Guaranteed Limon! I came across this sign recently and just had to stop to take a photo. I don’t know the technical difference between a “lime” and a “lemon”, but when it comes to used cars I think any business name involving a fruit is not a particularly good brand position (okay, maybe “apple” as a business name would be okay but I think that’s already taken). At best this is a family-owned and run business (and hopefully a very successful one), at worst it’s too much honesty in advertising. Today’s class: Fun with Trapezoids! I’m not sure I understand the seemingly random use of trapezoidal shapes in this motel sign (maybe those individual shapes were already laying around the sign shop and somebody decided to stick them all together), but I do love the fact that “TV” and “Air Conditioning” are the highlighted amenities – each warranting a trapezoid of their own. I guess that was the 1950s equivalent of free wi-fi. 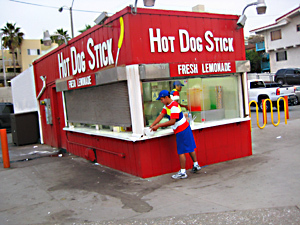 Even the lowly, beachfront hot dog stand can show it care’s a little bit about branding – from the coordinated striped shirts on the employees to the mustard-like squiggles of the bike stand, it’s all working quite nicely. “Fresh Lemonade” does seem like an afterthought, but I can live with that. Full disclosure – I did not try the product. 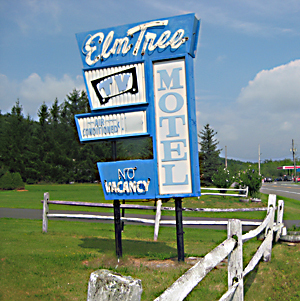 The Sign Remains the Same. Found this funky typeface on the side of a building in West Midtown. 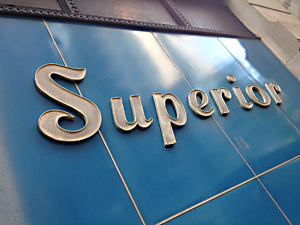 The only company I’ve ever heard of with the name Superior was Superior Ink, so maybe they were once at this location. It’s a big sign – the cap “S” is probably 2 feet tall – so I’m guessing that at one time “Superior whoever” was planning on staying in that location for awhile (no doubt that company is long gone by now). And that blue metal background is gorgeous – I had a Pontiac Tempest in high school that same exact color. Wile E. Coyote faucet? What? 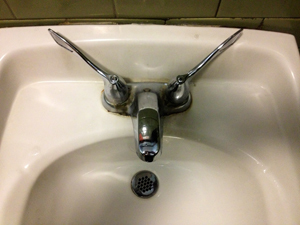 Lately I’ve been seeing faces in man-made objects – really mundane objects like faucets and hardware store items. So I looked it up (I mean I googled it) and found that “anthropomorhism” is the attribution of human form or other characteristics to things other than human beings. I’m not sure if there is a more specific name for attributing animal characteristics to man-made objects, but so far I’ve found a faucet that looks just like the Roadrunner’s nemesis Wile E. Coyote, a towel hook that reminds me of an octopus, and a metal bracket that resembles a robot with a drippy nose (saw that one while stuck in traffic in the Lincoln Tunnel).